Barley (Hordeum vulgare) is a member of the grass family. Its appearance resembles wheat berries, although it is slightly lighter in colour. 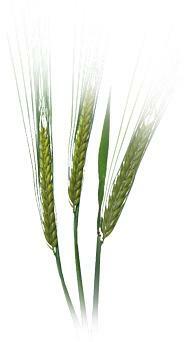 There is two-row and six-row barley, which means that in two-row barley, only the center spikelet develops a flower and seed, whereas in six-row barley all three spikelets are fertile. The latter has a higher protein content. With hulled or naked barley the hull is easier to be removed. In addition, barley´s dietary fibre, as well as oats fibre, is high in beta glucans, which have proven to help lower cholesterol. Barley was one of the first crops domesticated in the Near East. Barley played an important role in ancient Greek culture as a staple bread-making grain as well as an important food for athletes. Since wheat was very expensive and not widely available in the Middle Ages, many Europeans at that time made bread from a combination of barley and rye. Barley is grown worldwide. In 2007 the Russian Federation was the major country to grow barley (15,663,110 MT) followed by the Spain, Canada and Germany. Barley serves as a major animal feed crop, with smaller amounts used for malting, for which barley is the best suited grain. Beer and whiskey are produced with malted barley. Two-row barley is traditionally used in English ale style beers. Six-row barley is common in some American lager style beers. Foods based on barley are soups, stews and barley bread.